Deena Cortese and Chris Buckner talk about 'Couples Therapy.' Photo courtesy of Deena Cortese's Instagram. 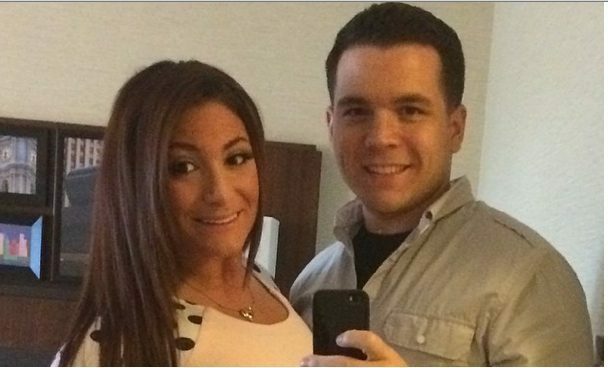 In celebrity baby news, Jersey Shore star Deena Cortese is pregnant and expecting a baby boy with her husband, Chris Buckner. In an Instagram post, the reality TV star captioned a photo, “Chris and I Decided to wait until we were ready to spill the beans! Now that we are safely into our second trimester.. us and our little monkey are ready to tell the world Our little family is growing ! We have a sweet little boy on the way! We Are truly blessed and our hearts are filled with so much joy and happiness December can’t come soon enough! Daddy and Mommy can’t wait to meet you Christopher John you are going to be the most spoiled little boy ever!!! !” The Instagram photo shows the couple standing next to a sign that reads “We’re so excited to say a little firecracker is on the way! Baby Buckner. December 2018.” According to UsMagazine.com, Cortese said back in March that her and Buckner were trying to have a baby. In celebrity baby news, another Jersey Shore baby is on the way! What are some ways to introduce your kids to your friend’s kids? 1. Set up a play date: The first step to introducing your children to your friend’s children is to actually set up a time and place for the meet up to happen. Pick somewhere you think your kid and theirs will be comfortable. Whether it’s your house, a playground, or somewhere else, your kid will be bound to have lots of fun! 2. Explain boundaries: Before the hangout, you should explain to your friend what your own kid’s boundaries are and any important things they should know. This way, your tots can easily get along without any avoidable problems. 3. Plan activities: You don’t want your children getting bored, so make sure you and your friend have plenty of fun activities planned for your children before introducing them to each other. This way, they can easily have something to do together. Have any more tips on how to introduce your kids to your friend’s kids? Comment below!